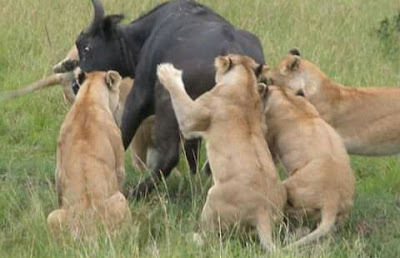 The hundreds of years battle between buffalo and lion still goes on in the Maasai Mara. Kenya Sets Ablaze Over 105 Tonnes of Ivory and Rhino Horns! 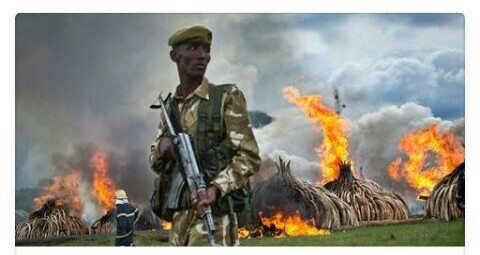 Over $170 million dollars of illicit wildlife goods set ablaze by the Kenyan government in an effort to convey a strong message against poaching. Most people get it, the astronomical number of elephants lost each year to poachers is insane, over 30,000 elephants lost each year to illegal trade and sadly it's gotten so big that it's run by sophisticated kingpins and each year seems to be getting worse! South Africa is making an effort to legalize this trade and maybe the idea is sort of like marijuana in Colorado am not sure, I think it's more like if you legalize it then there would be less value for trading it illegally and might not be financially viable for illegal dealers to keep going. I love animals and am open to ideas that would actually solve this crisis and maybe South Africa's idea would work and maybe not but anything at this point is worth trying because what's not declining is the number of elephants and rhinos lost each day and as a matter of fact it's increased substantially. So what's the solution and it's not elephants or rhinos only but in case you didn't know the pangolin has a lot of demand in Asia as well and poachers aren't discriminating and probably many more wildlife are at risk of extinction! Do I think it's a good idea to burn the largest stockpile of these illegal wildlife goods ever burnt in history, no I don't think so and I completely disagree that it would solve the core problem as far as poaching. The demand for ivory is going up regardless and to burn it is just likely to increase the prices even more and just to give you an example, there was a time when we heard in the news when some oil production facilities burnt in the middle east and what happened after that, oil prices skyrocketed. The same thing is likely to happen here and the publicity of it as well could go either way and probably benefit the illegal trade as well as they realize the scarcity of it, most likely boosting the prices. Kenya has burnt an enormous amount of ivory and rhino horns over the years starting in 1989 and has it solved the problem, unfortunately not and repeat of the same thing to expect a different result doesn't work on this planet, maybe on a different planet. Some people might argue sell it and use the money to protect what's left and that sounds like a good idea but it can't be done as most nations including Kenya have signed an agreement not to do so and not only that but also corruption might get in the way of making that a success. So my personal opinion just keeps it in a public museum and have government and independent overseers that publicly keep track of the goods and update it and even put the records on government websites. Why I think this is a better idea which isn't perfect but there will come a time when the wild has no more elephants and rhinos and unfortunately it's going to happen if this trend keeps up. It will be impossible to keep carcasses in a museum but of course much more sensible to keep the ivory and rhino horns as a constant reminder of the magnitude of wonderful wildlife lost and probably much more effective to future generations and burning them I think will be such a short-term memory that I doubt in two weeks anyone would remember this story, sadly! Notch Boys Turned Expert Hippo Hunters! These photos were taken just a few days ago of the remaining Notch boys on yet another hippo kill and this is the second documented hippo kill in the last four months and later after getting their fair share from the humongous kill as you can imagine it ended up feeding a lot more Savannah dwellers. 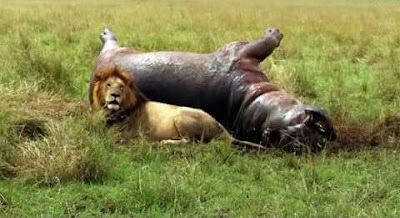 For many years the Notch boys have lived in the area amongst hippos and in the process evolved to take down one of the most dangerous animals in Africa. What's so amazing about lions is they possess such a different level opportunistically that the slightest error or disadvantage by prey automatically becomes the lion's biggest advantage and they will instantly act on it. When you hear that comment people say all the time when you see an opportunity grab it because it might never come again and lions have evolved to be experts at spotting an opportunity and grabbing it right away. For people it's obviously different in the sense that opportunities for survival are different but the idea isn't so different and this is just a personal take, any successful society if anyone told me they weren't opportunistic and better at it than the rest I would disagree and history has shown that but the story is just about how life has such general principles that we overlook all the time. Back to lions though because this is the part I would rather be talking about and one more photo of notch boys chilling and the power that comes through their eyes. 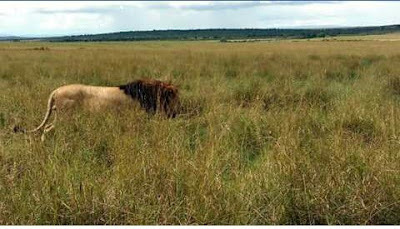 Am fascinated by lions and some of the reasons is just their ability to adapt so quickly in taking advantage of what they have, they're really good at studying their prey and I always say when you see a lion sleeping like we mostly assume be cautious because they might not. They're totally aware of their surroundings and that's the time they take to study their prey's daily movements! 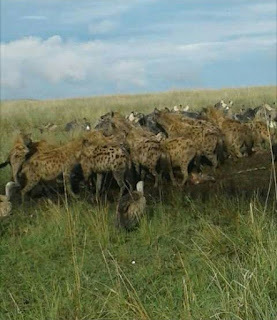 I had written a story before about the Notches and how strong they have been for longer than most coalitions and for the three out of five left and still going strong is amazing and I would challenge anyone to give me a lion coalition that lasted that long in the African Savannah. Hippo is the last animal you would want to mess with in Africa, they're extremely dangerous and one single bite from a hippo is enough to kill a fully grown lion and I can only imagine how hard it would be hunting one. The hippo's neck is so big that a lion has no choice but avoid that area all together and focus on their behind and possibly the spine,when you see lions jumping on the back of an animal that they can't take down they bite the backbone and constantly do it to try and damage the spine and not easy but if it works it would bring down the prey and that's the one thing I could see happening here but would definitely want to know more about how they've been doing it for years. Big pride have been known to occasionally take down hippos but for this male lions to consistently do it at least every few months is very intriguing. The weather today was rather crazy, windy and rainy and somehow at around 7pm for at least half an hour this amazing sunset appeared in the Palouse hills out of nowhere and I have to say it felt like the best thing that ever happened, so refreshing and I just couldn't resist taking a few photos. Have you ever just sat there and you don't feel like making anything for dinner but suddenly there's an urge to create something! I wasn't sure if it would work but I just threw stuff together and hoped for something edible and eventually it turned out better than I expected. I put some butter in a pan, heated it up then add chicken and let it nicely brown before flipping it. Dice up the mini peppers and add into the browned chicken then that way they won't be overlooked by the time chicken strips are cooked all the way. You probably might need to add more butter as it tends to dry out then once chicken is fully cooked and peppers cooked as well, add a touch of soy sauce or be flexible with your favorite spices. Then make mashed potatoes which is probably the easiest part just following directions in the package then add butter and shredded cheddar cheese and stir it well. There it is ready to serve the way you prefer. Try focusing on that picture and see if you can spot that cat and I bet you it won't be easy. If you look just in the center of the photo,just a little bit left from the center you will notice a dark spot and that's where the cat is,but the cat's head is actually on the dark spot. That cat was really hard to see even when I was standing right next to it and just to show you how perfectly camouflaged that cat was,look at the pictures below! Palouse River As Spring Begins! Topi is one of the smartest antelopes in the African Savannah that most predators find it challenging to catch. They have extremely good eyesight and spend most of the days grazing facing each direction and also climbing on top of ant hills to have a better vantage point of their surroundings. They also are very fast with great stamina that most predators can't stand and so most predators like lions are most likely to hunt topis at night to take advantage of their poor eyesight in the dark and that's where lions get successful hunting topi but this week in Maasai Mara near Olkiombo something extraordinary happened. There was a topi grazing near a little bush and no one really paid attention because there was nothing unusual about it, there are millions of grazers in the Mara after all but within a flash of a second a lioness popped out of nowhere and jumped on the topi's back and went straight for the head bringing the huge antelope down and just before anyone could take in what's happening another female lion flew from across the road and within seconds was there helping the other female lioness and just within minutes it was all over and it just happened so fast that the best footage we could get is this! Wild Turkeys on the Railroad. This morning was pretty interesting, just happened to be driving around 7am, the weather was absolutely fantastic, a little bit of sunshine and clear skies and came across this wild turkeys chilling on the railroad. I stopped for a few minutes to take pictures and decided to share them, I have personally never seen them that close and relaxed they're always sort of on the move but here I was for at least 10 minutes taking pictures and after I left they were still there and not seem to be moving elsewhere anytime soon. How About A Visit to A Gov't Office. This is probably one of the most remarkable male lion coalitions I have ever seen and maybe the last considering the population of lions in Africa is dwindling faster than ever. Am a huge fan and have tried to follow some of their stories the best I can so let's start with the Mapogos of sabi sands,this was a coalition of powerful six male lions that basically brought terror to lions of sabi sands and surroundings and with their ability no lions stood in their way it was constant killing and they cared less about anything but themselves and how much more area they acquired as part of their territory. 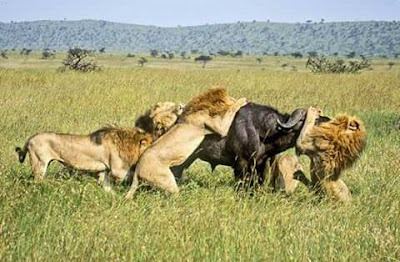 There was greed and too much power that led to lose in their own pride,they had absolutely no competition from other incoming male lions that eventually they started fighting each other and as a result two of the males moved on to form a new coalition and pride. That's where mistakes started happening and eventually other male lions started getting an upper hand and one of the two mapogos was killed and the remaining one ran for his life back to the four mapogos,now only five they ruled for a little while before they were taken down by the coalition of male lions that killed one of them prior,in one of the most brutal lion versions you could ever imagine and the irony was their extreme power and brutality ended in that exact version. 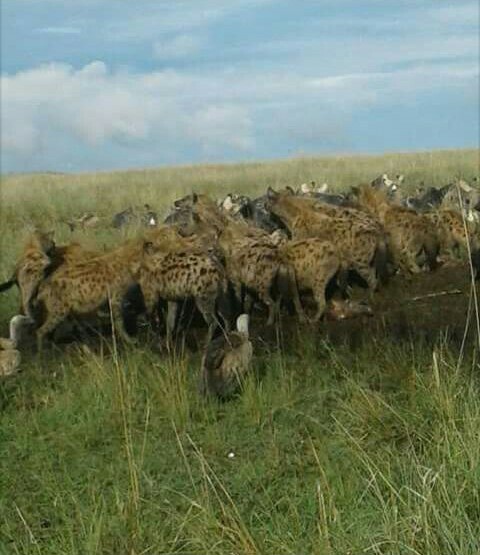 On the hand you have Notch and his five sons in Maasai mara. Their story is just as amazing but in a twist of ways Notch ruled in such a different criteria unique only to him that no other lions have ever been documented ruling this way and happened to be the longest and most successful rule a male lion coalition has ever done. Notch whom some documentaries have named him kali(swahili for brave),originally as a young adult male formed a duo with another male,now obviously you can't compare that with six mapogos so Notch began his life small and somehow as time went by they managed to take over a pride and he went on to raising five young sons,Notch 2,Grimace,Long,Ceasar and Ron. As you can imagine Notch and his partner were only two so it was only a matter of time before another coalition took over and that's exactly what happened and his partner was killed and the most bizarre thing happened that's never been documented in lion society,Notch ran for his life and took his five sons with him. 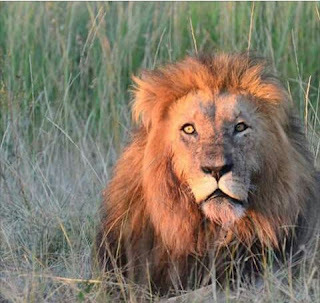 He ended up raising his five sons to be one of the strongest male lion coalitions ever and they came back to take their pride and took over nearby prides as well forming a very large territory. No one ever thought lions could use such a criteria and as we all know lions have always been known to kick out their own sons when they start adulthood and they care less what happens to them after that. Notch left such a legacy that's just unique to him,he eventually grew old and died and Grimace and Long passed on as well and Ron,Caesar and Notch 2 remain a very powerful coalition to date as a matter of fact in late February of 2016 they were documented on a hippo kill,that's major it shows they're stronger than ever and their rule has remained for over a decade,in a tumultuous lion society in the African wild that's unheard of! Sometimes you could just be chilling and thinking to yourself if I want to have a great steak dinner then it's probably going to be a drive to the last restaurant you had the best finger-licking steak ever and of course spend probably at least $30bucks,but you probably dont always have to go there to get a top notch steak. The question becomes how do you get the best grilled steak without spending a lot of money or leaving the comfort of your home and this is my personal experience that I think could be useful to someone out there,always try buying steaks while on sale at your local grocery store and do your research to find out if they get their meat locally that means more fresh and possibly less additives as you know if they get them across the country the longer it takes to get on the shelves and the likely it is for more additives to extend the shelve life. Every once a while your local store could have a meat sale,pay attention to that because it might be 50% off the regular price and get a few steaks and keep them in the freezer,you"ll probably save yourself at least $50bucks each time. Depending on how you like your steak whether you like it rare,medium or well cooked the key is the spices you use and of all the spices I have ever used in at least 10 years this is the spice that will change your life when it comes to eating grilled steak and I absolutely don't think there's any other comparable spice that's on the market. I personally buy a lot at once and it lasts a very long time. 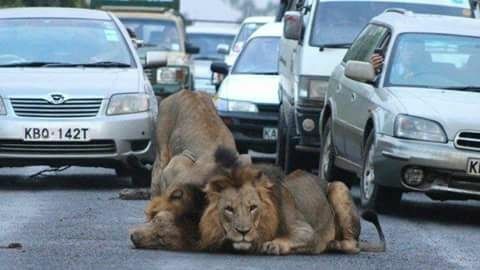 Photos Taken of the Two Male Lions That Escaped Nairobi National Park! So for those that don't know Nairobi,it's the capital city of Kenya in east Africa with a population of more than 3million people and just to give you a rough idea of how that looks like its about 4times the population of Seattle and so it really is a very busy atmosphere people wise. Kenya generally has more than 35 national parks and reserves,but what makes it even better is it happens to be probably the only capital city in the world with a national park in it and obviously fenced. Before you enter Nairobi national park,they have an animal orphanage,might sort of look like an advanced zoo but it's completely different because the main purpose of it is to save some orphaned animals around the country especially endangered species and some of them end up getting integrated back to the wild either in Nairobi national park or other parks around the country. Unfortunately there's been a few cases and this obviously happening now,where lions find a way to escape the park,don't know how they did it with an electric fence but obviously the two adult males figured it out.Originally the Kenyan wildlife service reported that a female with cubs and two other lions did escape as well but two of them came back to the park and the female with cubs didn't go too far as she was nursing and was recaptured.What makes this story so interesting in my opinion is this has been probably the longest period in which the two apparently male lions just disappear out of sight from the wildlife authorities yet somehow they end up chilling in the middle of a busy highway like in the photo taken above then shortly after disappearing into thin air and authorities as of now still can't locate them! Unless You're Allergic, You Can't Ignore Mushrooms! 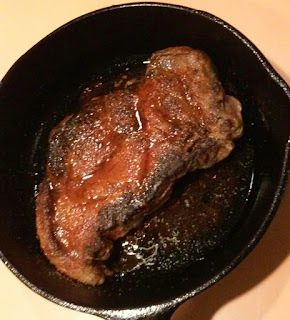 This recipe is so easy that you literally almost don't have to think at all while making it. 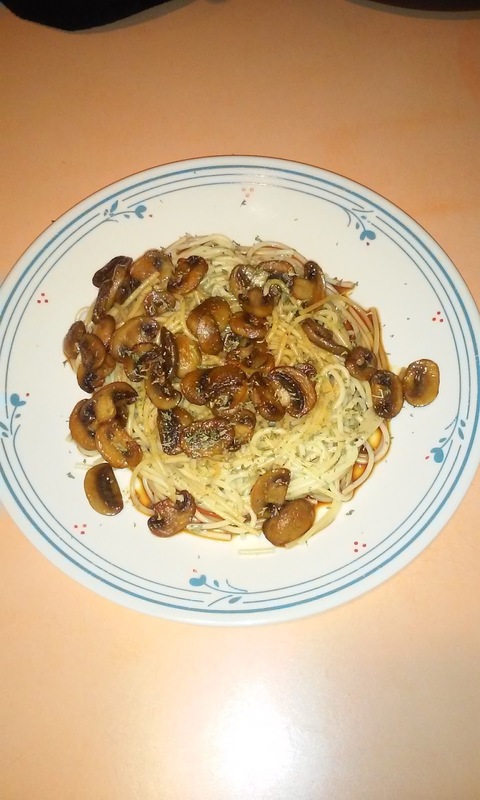 Really straight forward and as you can see I made it two different ways and first picture shows creamy mushrooms over spaghetti and the second one is mushrooms with a touch of soy sauce over spaghetti. You don't need a lot of ingredients for either coz it's that simple so am not going to list,will just start with how I made it and for the first one you start by boiling however servings of spaghetti,then heat up a pan with a little bit of olive oil and take about 4ounces/per serving of half sliced mushrooms and drop them in the hot pan.Once the mushrooms turn sorta dark brown turn them over and do the same for the other side,it really should only take less than 10minutes to be done. After the mushrooms are done,dish up your spaghetti and put the mushrooms on top,then take the same pan and add about 4ounces of water then add powdered creamer,then thicken it with either flour or cornstarch and if you want an even richer taste you could add parmesan cheese or use half n half instead,don't forget a touch of garlic,onion powder and salt.When the sauce is done,pour it over your dish then sprinkle some parsley over everything. 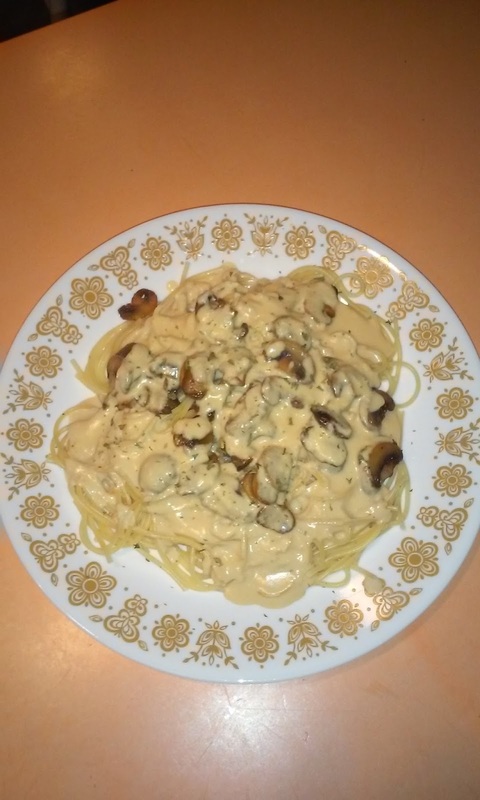 Now do I think this tastes really good,oh absolutely but if I wanted to stay on the healthy side,then I probably won't choose this one but go for the second option which pretty much you follow the same process except at the end instead of the creamy sauce,just add a touch of soy sauce on the mushrooms and put it over the spaghetti then sprinkle parsley flakes on it.It's definitely less calories from the first choice and if you wanted to go a step further,you could always use whole grain pasta. On a personal note I whole heartedly believe if you really want to eat healthy food,you just can't ignore Mushrooms,it has less than 20 calories per serving,you get vitamin D,about 300mg of potassium,zero cholesterol or sodium and depending on the kind of mushroom you get selenium which by the way if you don't get to eat salmon then mushrooms will give you that.Don't forget too that mushrooms also give you tryptophan which apparently is a crucial amino acid that the brain needs to make serotonin which melatonin also needs and am not a scientist so I can't tell you how the process works but what we know is we need melatonin for better sleep and serotonin is important in reducing stress or depression.If you're interested in learning more about that,I will let you do your research but what I know so far is I personally can't ignore mushrooms. I love writing about wildlife and this might seem unrelated but personally I just don't think you can separate food from the wild and yes its easy nowadays to feel like food has no relationship with the wild due to the fact that almost every food goes through a lot of processing and we just simply walk into a store and buy it. What we forget is even though there's the business side of it when it comes to food processing,I will bet you a nickel that almost all food still comes from nature and I don't know of much foods that are produced in a laboratory and I probably wouldn't care to eat it if I did. A lot of foods might still get discovered in some forest somewhere with so many of what our bodies need nutritionally and if you think about it,mushrooms once probably looked like some useless fungus out there and now it turns out to be one of the best foods you can have. There was once a time when people collected food from nature and appreciated the land or sea that gave it to them. I hope one day we care enough to protect our wildlife before everything slips away. The thing I love about this powdered creamer is you can use it to make creamy tasty sauces just by boiling some water and adding it,then thickening it and seasoning with salt,garlic and onion powder or wherever choice of spices or adding any cheese of choice to make either alfredo sauce or any other cheesy sauce.